Georgia Advanced Directive for Health Care Form (POA & Living Will) is considered a medical power of attorney. This is paperwork is presented as a template that allows a person to express end-of-life treatment wishes, names a representative to carry out these wishes, and has been created pursuant to Georgia Code O.C.G.A. Title 31 Chapter 32. In order for the finished document to be considered an authentic report of the principal’s medical preferences it will need to be signed in front of two witnesses. An individual with even a general idea of how he or she wishes to be treated during a medical event will find this document a useful precaution in making sure his or her wishes are communicated properly when incapacitated and unable to represent himself or herself. Durable Power of Attorney – Often used in conjunction with a Medical Power of Attorney, it provides the Principal with the opportunity to elect a financial representative. This form is readily accessible by selecting one of the buttons below the image. This will open the required paperwork as the type of file you have chosen. The first space in this document, following the word “By,” should have the First and Last Name of the individual granting Authority (the Principal) recorded just above the words “Print Name.” The next line, labeled “Date of Birth,” will need the Birth Day of the Principal entered in an mm/dd/yyyy format. Locate page 3. 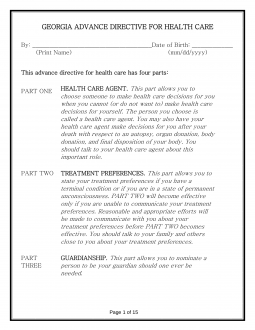 The blank spaces below the heading “Part One: Health Care Agent” have been provided so the identity of the Health Care Agent may be documented properly. In the “Health Care Agent” section, enter the First and Last Name of the individual this document shall designate as the Principal’s Health Care Agent. On the blank space, labeled “Address,” the current and complete Address of the Health Care Agent must be entered. Make sure this includes a Building Number, Street Name, any relevant Unit Number, City, State, and Zip Code. The Health Care Agent’s current Telephone Number(s) should also be presented. If possible enter the Health Care Agent’s Home Phone Number, Work Phone Number, and Mobile/Cell Number in the appropriately labeled spaces. In the space labeled “E-Mail Address,” report the Health Care Agent’s current E-Mail Address. The Principal may also choose to designate a Back-Up Health Care Agent. If so, this may be done in the second section. A Back-Up Health Care Agent will only make Health Care Decisions on behalf of the Principal if the Primary Health Care Agent is unreachable or otherwise unable to act in this capacity. Such an entity provides a significant amount of security but must be precisely named in this section. This section is optional and will have no other effect other than to name a Back-Up Health Care Agent. There will be enough room to name two Back-Up Health Care Agents. Under the heading “First Back-Up Agent,” record the Full Name, Complete Address, Home Telephone Number, Work Telephone Number, Cell Phone Number, and E-Mail Address of the Back-Up Health Care Agent who will assume the Decision Making Powers in this document if the Primary Agent does not. The following sections, beginning with “General Powers of Health Care Agent,” will define the overall responsibility and powers the Health Care Agent will be expected to assume as a result of this form. The Principal should read through this section carefully. If any part of this text contains wording the Principal does not wish used or included, then it may be crossed out. Any alterations will need to be initialed by the Principal. The next area requiring attention is section “(5) Powers of Health Care Agent After Death.” Subsection A will seek to define whether the Health Care Agent will have the Power to authorize an Autopsy on the Principal’s body. If so, then do not mark this section. If not, the Principal should initial the blank space in this section. The next area, titled “Organ Donation and Donation of Body,” will seek to define the Health Care Agent’s Powers in terms of the Principal’s remains. If the Health Care Agent will not have to power to donate the Principal’s Body for a Medical Study Program, the Principal will need to initial the first blank space in “Organ Donation and Donation of Body.” Otherwise, leave this space unmarked. If the Health Care Agent has the Authority to donate the Principal’s Organs (after death), Principal will need to initial the second statement in the “Organ Donation and Donation of Body” If the Agent will not have this decision making power, the Principal should leave this statement unmarked. If the Principal wishes to name an individual to decide what to do with his or her remains, the Identity and Contact Information of this individual must be documented. This should be done on the blank lines labeled “Name,” “Address,” “Telephone Numbers,” and “E-Mail Address.” Make sure the information requested on these blank lines is up-to-date and accurate. The next part of this form, “Part Two: Treatment Preferences,” will seek the Principal’s wishes regarding what a Health Care Agent should consider a priority of the Principal should the Principal be unable to communicate but require medical attention. Locate Section 6, “Conditions,” in Part Two. This will determine when Part Two becomes effective. If the Principal wishes the instructions in this section to go into effect when he or she faces a terminal condition where death will occur shortly then, he or she must initial the first statement. If not, leave this line blank. If the Principal wishes the instructions in this section to go into effect when declared in a state of permanent unconsciousness, the second statement will require the Principal to initial it. If not, leave this line blank. Once these tasks have been completed, it will be time to define what Part Two’s Instructions are. This may be defined in Section 7, “Treatment Preferences,” here you will be presented with three options. The Principal should initial A, B, or C. If the Principal initials Option C, he or she should continue the definition for Treatment Preferences by initialing the applicable statements immediately following Option C.
Whether the Principal has indicated he or she wishes the instructions for Part Two to go into effect upon a Terminal Illness, becoming Permanently Unconscious, or both, a definition of Treatment Preferences in either or both situations will need to be defined. If the Principal wishes his or her life extended as long as possible in either or both of these events, then he or she must initial Option A. If the Principal wishes a Natural Death to occur, then he or she must initial Option B. Option C will provide a bit more flexibility than Option A or B. If the Principal wishes certain types of treatment but not others, Option C should be initialed. If this option has been selected, then continue below. Otherwise, go to the next section. If the Principal wishes to receive Nutrition, even artificially, the Principal should initial the first statement after Option C. If the Principal wishes to receive Fluids, even artificially, he or she should initial the second statement after Option C.
If the Principal will accept Ventilator aid to breathe, he or she must initial the third statement after Option C. If the Principal will accept Cardiopulmonary Resuscitation (CPR) if his or her heart/pulse stops, then he or she must initial the fourth statement after Option C.
Section 8, “Additional Statements,” should be considered optional. That is, Part Two, if defined by the Principal may stand as it is once it has been approved, filled out, or altered by the Principal so that it conveys his or her wishes. But what if there are more considerations the Principal wishes to take into account. If so, they may be reported and instructed upon by the Principal directly in “Additional Statements.” In fact, if the previous sections in Part Two have been left blank, whatever reported here by the Principal will be considered valid instructions by the Principal that must be honored. The Principal may use the blank lines provided or cite an attachment if more room is required, to report his or her preferences. For instance, the Principal may have specific wishes for specific scenarios or the Principal may have religious beliefs that interfere with only some treatments. Part III will take Guardianship into consideration. Some scenarios may involve a Principal, whose estate will have a court-appointed Guardian declared. Generally speaking this is a separate process and beyond the scope of this form, however, the Principal may nominate a Guardian for the court’s consideration in such an event. If the Principal wishes to nominate the Health Care Agent defined in Part One as his or her Guardian or Estate Guardian, he or she must initial Option A (“I nominate the person serving…”). If the Principal wishes to nominate a specific individual as his or her Guardian or Estate Guardian, the Principal must initial Option B (“I nominate the following”). If this option is chosen, the Name, Address, Telephone Number(s), and E-Mail Address of the Nominee should be declared on the blank lines labeled “Name,” “Address,” Telephone Numbers,” and “E-Mail Address” available below Option B. The final segment of this document, “Part Four: Effectiveness and Signatures,” will define when the instructions in this document should have power. Locate the statement ending in “…the extent authorized in Section (f) of Part One).” If the blank spaces below this statement are left unattended, the Power of this document will go into Effect upon the Signature of the Principal and only terminate upon the Death of the Principal. If the Principal wishes to name a specific Date of Effect, then he or she should initial the blank line preceding the words “This advance directive for health care…” Then, on the blank space following these words, report the Calendar Date, Month, and Year when this document’s Power become effective. The next statement is provided for the Witness. This is the individual who will view the Principal signing of this document. Two separate areas are provided so that two separate witnesses may sign their Names on the Signature line, record the Date of Signature, then Print his or her Name and Address.